Layers cut all over this short chic 'do makes it easy to blow-wave into the shape by smoothing down the top while adding body to the roots and flicking the ends. The bangs are swept across the forehead to soften the face and completes the over-all hairstyle brilliantly. Product is needed to tame fly-away hair. Our model is looking chic with a face framing shag hairstyle and a side swept fringe. She has an enviable oval shaped face which allows her to try different looks with ease. Her naturally fine hair has been blow dried into place here with a soft flick at the ends for a soft finish. Our model has a high forehead so she needs to be careful of wearing too much height at the top of her head or exposing too much forehead. Here she wisely chooses layered side-swept bangs that not only highlight her green eyes but also camouflages her high forehead. The finished look is chic and polished with a bit of a Seventies feel to it. Our model has a fair complexion and bright green eyes. She is wearing her hair in a medium copper shade with light blonde tips. 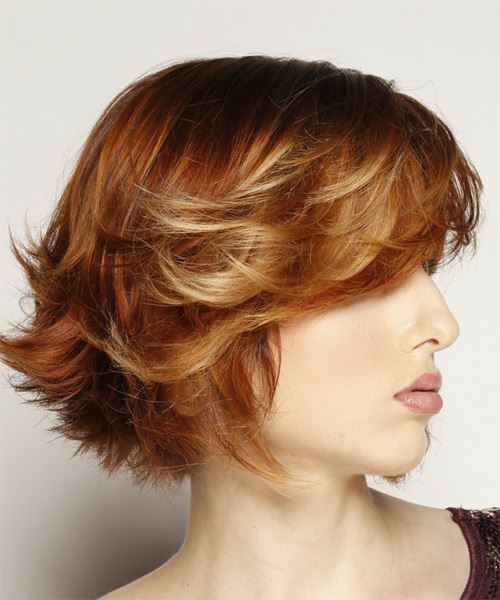 The bold highlights enhance her copper locks and also provides a vibrant contrast of color. Overall this hair color compliments her eyes well and adds a glow to her skin tone. Use gel spray at the roots to lift fine hair before styling.